Running Press Kids, 9780762437597, 10pp. Brother and sister chocolate bunnies explore a confectionary wonderland inside the "Sugar Egg " On their journey, they explore fields of spun-sugar flowers, a jellybean waterfall, and meet some favorite springtime friends, including marshmallow chicks and sugar cookie lambs Each spread has a special surprise--candy eggs hidden in the art for little ones to find. Reminiscent of a Faberge egg, this durable toddler-friendly board book with glitter on every page is sure to capture the attention of little ones, and will be a perfect addition to any Easter basket. 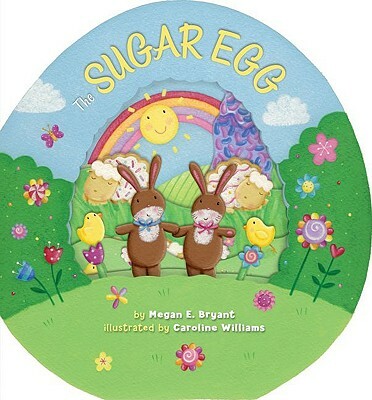 Megan E. Bryant got her start as a children's book editor. She now pursues a career in writing, and has produced more than 100 licensed storybooks, chapter books, Easy Readers, and board books. She lives in Winston-Salem, North Carolina, with her husband, a university professor, and her one-year old daughter.Caroline Williams graduated from Lincoln De Montfort University. She began her career illustrating for the greeting card industry. Her career is taking a new turn as she enters the world of illustrating for children's books, which has always been one of her lifetime goals. She works from her home in Nottingham, UK.